In his youth, this future professional wrestler was turning heads and gaining recognition in another facet of sports. He began displaying his talent and determination at an early age and was anticipated to be an emerging star in the world of baseball. He could have easily taken this talent to the next level and turned pro, but the young star became more and more fascinated in another sport he was pursuing in which he was equally as talented. And that’s where the legend of professional wrestling biography begins. His high school amateur wrestling background was a natural stepping stone into the “big time”. His real love and sole ambition became professional wrestling. Watching the professional wrestlers on television and reading about them in the wrestling magazines, he wanted to become a part of that world. He soon decided to take action and make his dream a reality. In 1970, he started training in Portland, Oregon under the supervision of retired World Jr. Heavyweight Champion Jack Kaiser. Kaiser was a wrestling star from the 1950 & 1960 era, and “knew the ropes”. He had much to offer an emerging star in professional wrestling. Early in 1971 he entered the wrestling ring for his first professional wrestling match and his life long dream had come true. As with all his efforts, the wrestler strived for excellence in and around the ring. This meant intense hard work and dedication to the craft. He had to stay in top physical conditioning and have sharp ring savvy. He had 5 to 6 matches a week and appeared regularly on television, for championship matches, interviews, and guest appearances. He had once followed wrestling careers in magazines and newspapers, now the magazines and newspapers were following his career. He had made it to the “big time”. 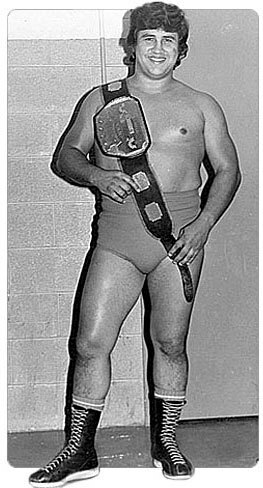 He wrestled professionally from 1971 through 1977, holding 7 different championship belts in singles and tag team matches. While wrestling, he traveled all over the United States and Canada working in numerous organizations including the National Wrestling Alliance(NWA), American Wrestling Alliance (AWA) and the World Wide Wrestling Alliance (WWWA). When he was not traveling, he would still stay close to the sport by working with high school wrestling teams and their coaches training their up and coming stars. Throughout his wrestling career, he had the honor of working with many of the Superstars of the wrestling business. He got the chance to make friends and forge alliances with those he had been idolizing for so many years. Among these icons were Danny Hodge, Gorgeous George JR., Andre the Giant, Dory Funk, Terry Funk, Jimmy “Superfly” Snuka, Bo Bo Brazil, Lew Thez, Jerry Lawler, and the Fabulous Moolah, just to name a few. Like so many professional athletes will attest, however, “your body will be the first to tell you when it is time to retire”. So in late 1977 he decided to listen to that notion and chose to retire from the ring to enjoy life and his family. After retirement, the wrestler’s love of aviation led him to pursue a new career in airline technology. As in his other pursuits, once again his intelligence, drive, and determination, gained him the recognition and industry excellence he has always strived for. Currently, the wrestler resides with his family in Austin, Texas. 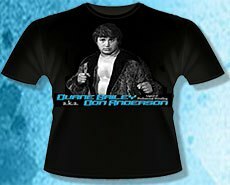 Get cool wrestling memorabilia, T-shirts and autographed photos from Don Anderson. Keep watching for the online fan shop – Coming Soon!